Dinners that don’t require a recipe are the best…like this one. Mediterranean chicken is so easy to make and melts in your mouth. Just sauté chicken thighs in olive oil with some sliced garlic. Top each one with a slice of Meyer lemon, add a half cup of chicken stock, and get creative with whatever you find in your pantry. 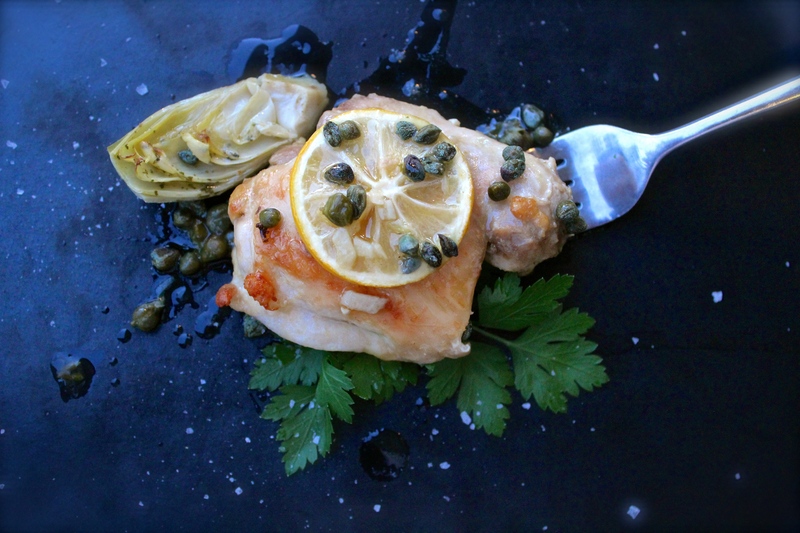 Here I added marinated artichokes and capers, but normally we add green olives. Finish the chicken in a 350 degree oven until the sauce thickens, the garlic and lemon are golden, and the thighs are cooked through. Once you make this a few times, you can do it with your eyes closed. On day 72 of this 365 day project, I ate my daily five (including a banana breakfast cookie). Did you enjoy yours?